I’ve had my child cooking with me since she was two, and even before then she was hanging out in a backpack watching over my shoulder as I prepared meals. The Kiddo even asks to watch me cook, pushing over a dining chair to stand on herself. At the tender age of three, she even does some of the cooking. Surprisingly, there are many kitchen tasks that a child this young can help with. If you are in need of advice on when and how to get your kid cooking, this book, Salad People and More Real Recipes, may be a perfect fit. The author has also written Moosewood Cookbook, a top vegetarian title. When I opened the book, I quickly realized this is not a book for me to cook recipes from, it is a cookbook for my child to cook from. 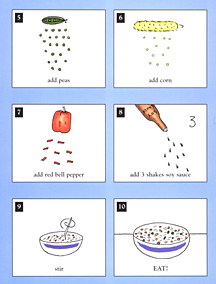 The recipes feature short lists of ingredients and easy, fun illustrations instead of instructions. Even children who do not read yet will be able to identify the steps and follow along. The recipes start with the fun tips on making salad people and include other dishes like Polka Dot Rice and Counting Soup; all sound as creative and fun to prepare as they are healthy and tasty. All twenty recipes were tested in the kitchen with cooks ranging in age from just under three to age six. Deciding factors on the recipes to include in the book included the kids’ interest in eating the finished product as well as important considerations such as attention span, tasks, flavor, and variety of ingredients. Each recipe includes information for the parent or teacher to help prepare for the cooking lesson and make sure the experience is a success. Indeed, the instructions for parents are of great value since they provide good insight on how to help your child learn to cook and the lists of age appropriate tasks and safety advice you need. 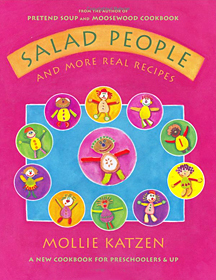 Katzen has published two other books for young cooks; Pretend Soup and Other Real Recipes for preschoolers; and Honest Pretzels for kids aged eight and up. She is currently a consultant and co-creator of Harvard’s Food Literacy Initiative. My 4 year old son has loved Salad People since he was 2.5! We have tried Pretend Soup as well, which is also great, but Salad People is his favorite. We finally bought it after using the library’s copy so many times! He’s now taken to creating his own recipes, which is pretty cute, although not always tasty!